Meet the Garza family. They are seven members strong and are of Mexican-American descent. After years of not feeling well, Veronica was diagnosed with Lupus. She was overweight and felt exhausted all of the time and depressed. She spent years trying to heal herself through the guidance of the medical community who prescribed a cocktail of medications. To her physicians, it seemed that medicating her symptoms was the only answer. Most of the medications caused many side effects that certainly did not help her healing process. Veronica was looking for another way to deal with her autoimmune disease since the medications were not helping her symptoms. Her brother did some research and came across several articles that pointed to a gluten free, and grain free diet. Along with dietary changes and a prescription of regular exercise, Veronica started her healing process. She knew in her heart that this would be the best plan of action to heal her body. She didn’t think she could do it alone as she lives in a multigenerational household and on a daily basis ate the foods of her heritage. In her Mexican-American family and community tacos and fajitas were always served on warm flour or corn tortillas. She knew continuing a diet like this was heading her in the wrong direction. 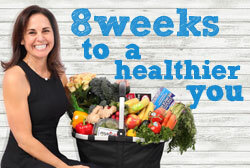 Veronica made a commitment to a plan of action to eliminate the offending foods and eat a low inflammation type diet. She was committed to seeing if her symptoms would change. She came home and presented this new lifestyle to her family and asked for support. The family started to exercise together in their backyard, and soon opened a CrossFit gym in their hometown after realizing that the exercise positively benefitted the entire family. The family also recognized that to support Veronica on her path, the household cooking had to change. Veronica created a soft tortilla made of almond flour. It wasn’t quite the same as the flour tortillas or corn tortillas her Grandma made, but at least she had a substitute. You see in her family, most of their meals were placed inside a soft warm flour tortilla or served with tortilla chips. It was the main staple that constituted a large part of the family’s diet. Ingesting these foods were damaging to her body and aggravated her already horrible symptoms. When Veronica made the first grain-free tortilla, her Grandma said that it tasted even better than the ones she had made for many generations. This great tasting soft tortilla immediately passed the family’s taste test. Everyone liked them, so they did a Pantry makeover and removed the offending foods from the home. Veronica then began sharing the almond flour tortillas with gym members and staff. She had rave reviews and knew that she was on to something. She increased production and created additional grain-free tortillas with coconut and cassava flours which resulted in a successful business. Next, she worked on a great-tasting tortilla chip, made with simple ingredients and healthy oil. This simple salted tortilla was enjoyed by all of the family members. Now, eight years later, it is a thriving company. What started in her kitchen with her Abuela’s approval is now a thriving company with 25 employees. It is growing fast as many people are choosing a grain free lifestyle or at least trying it on for size to see if they feel better in their bodies. The products are sold in Whole Foods and other supermarkets. The product line has expanded quite a bit and is continuing to grow. Check out this link to look at the whole product line and find out where they are sold.